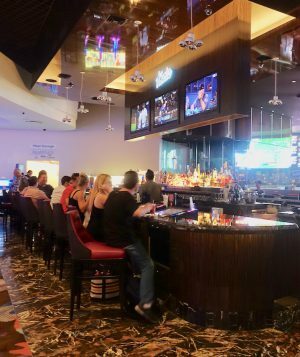 Patrons at the Tonic Bar at the Palms Casino/Resort/Spa can enjoy a cocktail, conversation, video poker AND watch sports. Just west of the Strip, on 30 acres of property. is a casino hotel that for years was known as a daytime destination for local gamblers and an evening destination for young folks looking for a good time. But times changed, and the Palms, on Flamingo just west of the Strip, lost some of its loyal customers to other newer casino hotels. The property was sold and sold again. 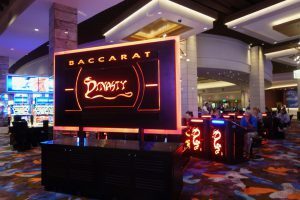 The current ownership, Station Casinos, is essentially starting over with renovations and new offerings under the theme, “turning dust to gold”. Like a number of the Strip casinos, the Palms also has made efforts, through its restaurant offerings and a beautiful baccarat lounge, to appeal to Asian visitors. I personally see the Palms as a classy (new artwork is everywhere) destination with options for affordable entertainment as well. Walk into the Palms today and see a bright modern decor and, last Thursday night, huge lines of people waiting to get into the very much improved Palms buffet. (I had sampled the Palms buffet several years ago and thought it was one of the worst buffets in Las Vegas.) On Thursday I had planned to stay for a buffet dinner, but the long lines were discouraging. However, the good news is that the new buffet is VERY popular. A new Baccarat lounge at the Palms seems already a popular destination. The Palms drinking destination I absolutely loved was the new Apex Social Club on the 55th floor of the Ivory Tower in the location of the former Ghost Bar. 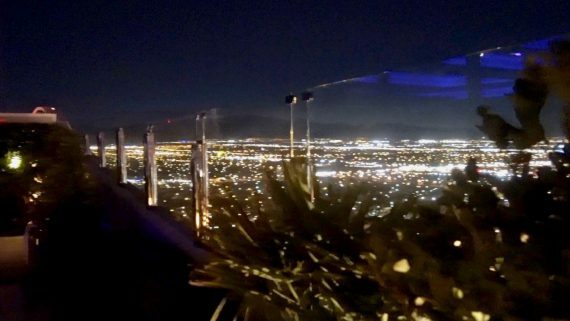 What an environment for a drink and view of the Las Vegas valley! Frankly the views are so spectacular I wouldn’t even complain if the drinks are overpriced. In my visit to the Palms, seen on the attached video, I did not see everything. Rooms (starting at $50 a night plus resort fee) have been renovated and the use of the “resort” and “spa” names in the Palms’ big sign must mean that the pool area is lovely and important spa services are available as well. The view from the Palms’ Apex Social Club includes views of the whole Las Vegas Valley. BUT, what I did see was impressive for a renovation. Often, renovations look a bit like lipstick on a pig, but in the Palms case, the upgrades give a very new look to the location and are impressive. Well done, Station Casinos. I’ll be returning for another video visit when everything is complete. Great video Diane. And the story is very informative. Loved it. Thanks. Di that was terrific ! You have seen places I haven’t seen yet! We are still a work in progress but so far it’s beautiful. I can’t wait for the pool, I’m sure it will be a knockout. Feedback from guests at Scotch 80 is phenomenal. Our buffet as well. Sorry I wasn’t here ! may come back iin the future. I want to encourage one to continue your great work, have a nice morning!